Back in 1998 I started writing articles for Nuts & Volts Magazine. During that time Harry Helms, who was a Nuts & Volts Columnist was also a publisher. He liked my writing style and asked if I've ever considered writing a book. Harry helped publish the Radio Shack books written by Forrest Mims which I learned a lot of my early electronics from. I was excited to work with Harry. 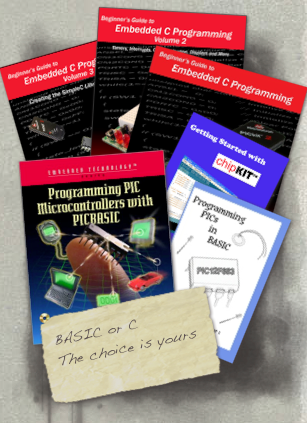 My first published book was Programming PIC Microcontrollers with PICBASIC. Harry sold his company and my book was now published by Elsevier Science. I quickly found the publisher tends to get all the profits and didn't do a whole lot to promote the book. I also didn't have any control on the price which went up quickly and made my book too expensive for most beginners who I wrote it for. So in 2005 I self published my book Programming the Basic Atom Microcontroller. To have control over price, marketing and distribution was great and from there I was hooked. I've self published ever since. I've now published nine books that I wrote and two that other authors have written. My books are my way of documenting all the information I've gathered over the years and my attempt to teach future generations the same way Forrest Mims books taught me. It's through books sales that I pay for everything that goes into this site. So if you like what you see here please consider buying a book you'd like to read to help fund this site and keep it going.